If your living with Type 1 Diabetes, chronic illness or going through some life challenges, what 3 things can you be grateful for from the challenge? Sometimes we cannot change our situation but we can change how we act, react or "be" through it. So what are you going through and what are your Grateful 3? As a T1D, we have to be prepared and prepared for the worst most of the time and depending on where in the world you live, you might have the possibility for earthquakes, floods, tornadoes, hurricanes, tsunamis, heat waves, volcanoes, landslides, wildfires, and more! Basically, things can happen that are out of our control and being prepared is essential. We hope you saw our "Qpack" video for Quick Day Trips and this Video is about having an Emergency Pack for your Diabetic Supplies that has a handle and a more robust supply. Check out our resource page for a full emergency preparedness kit and hope this reminds you to make your kit today so you don't have to worry about tomorrow. Stress can take a toll on our bodies. As a Type 1 Diabetic, it can even take a toll on our blood sugars, because it can make us a bit more resistant to our insulin, which means we'd have to either take more insulin or find ways to reduce the levels of stress in our body. It might help to take a moment a few times a day for a deep breath and to relax, it can help you to not only feel better but potentially help your blood sugars as well! As a T1D, we have to be prepared and prepared for the worst most of the time (sensors and pumps failing, insulin not working, losing a device), yet sometimes we forget that just going for the day, things could happen that are out of our control. Being prepared and making sure to take a little extra, even on trips away from home for the day can bring more peace of mind. We never know if something could happen and keep us from getting home when we need too. I'm still getting into the groove of this myself yet I am feeling better when I take my QPack with me. Check out our resource page for a full emergency preparedness kit. It's easy to sometimes let our situation dictate what we can or can't do and this video is to remind us all that we can do anything we put our mind and effort into doing. May it also bring some inspiration and motivation for you to make your goals and dreams a reality. Battling being sick can be tough for anyone, add being a Type 1 Diabetic and its complicated. Watch this video for a few tips on how to keep on top of your sugars while not feeling so well! Happy New Year! May 2019 be an incredible year ahead for each and everyone of you, filled with all you desire and completion of the the goals you've set for yourself. (If you haven't set a 2019 goal, now is the time or you can choose a word for the year that you'd like to be or become). My Word for 2019 is "Action" - NO Excuses in 2019! Shugga's word is "SWEETLIFE" because he is all about living the Sweetlife! What is your word? Riding the Diabetic-Coaster definitely includes Battling Highs throughout the day, depending on insulin, no exercise and of course what we eat or drink. Check out this video to hear a few tips on how we Battle the Highs. This video dives into how you feel when your blood sugar drops too low and that you can actually lose your feeling of going low if this happens consistently over time. Don't worry, if it does happen, you can get that feeling back of going low, if you bring your blood sugars above 100 for a period of time. I've battled mostly lows in my Diabetic life and I actually went for a few years living with Hypoglycemia Unawareness, one of the reasons I got Shugga to help me in the first place. To hear I could regain this was such a blessing to hear and since then I've worked hard to keep my blood sugars up and regained that feeling once more! Battling BloodSugars, Get Your Copy Today! Battlilng BloodSugars is published and ready to ship to your home! We hope you enjoy this fun illustrated book that breaks down how Diabetic Alert Dogs work and some fun along the way, and Shugga is telling the story. Make sure you watch this video and get checked by a doctor or medical professional if you or a loved one has any of these symptoms. If you are newly diagnosed or battling blood sugars for awhile and looking for some guidance, sign up for our Diabetic Coaching on our page "Book & Coaching", Shugga and I look forward to chatting with you soon. Check out this video for a snapshot of What Type 1 Diabetes is. Of course there is much more than what we shared in our video, so get out there and do some more research because there is a lot of information available on Type 1 Diabetes and how our bodies function. Very interesting! Shares about how Type 1 Diabetics can have sugar yet we always need to be thinking about the impact those yummy treats can have. To be honest I've gone from one extreme to the other, eating to much sugar, to no sugar at all. What I've found is that it really comes down to balance and moderation, as well as, knowing the numbers - carbs vs. insulin needed to have the least amount of impact on my blood sugar. (Also some finger crossing at times, hoping that I got it right)! 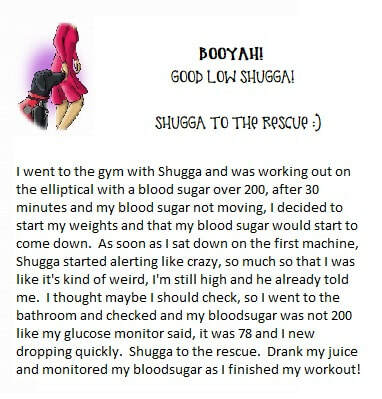 Check out this great video of Shugga showing how he goes to get his Chosen 1's "Checker" to test her blood sugar. This is by far one of Shugga's favorite things to do. We also share about this in his book which you can purchase on the website! Are you looking for someone to chat with or have a child struggling with battling blood sugars and the balance of life living with diabetes? Are you a parent or family member and want to have some coaching around taking care of your loved one. Coaching is personalized to your situation & purpose for coaching, can be weekly or monthly. For more info and to sign up, on our home page click the box labeled "Diabetic Coaching". We'd love to do a Shugga Talk for your group, if your interested, Click on "Book Now/More Info" under Shugga Talks. 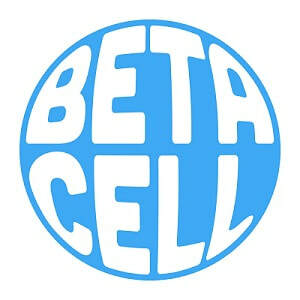 I'm so excited about our launch, please send us your questions on the "Connect" page, we'd love to give you a shout out and answer your questions or talk about a topic that might be interesting for other Type 1, 2, and 3's! Get your copy today - "Keep Living the Sweet Life"!